Denmark is the happiest country in the world, according to the latest World Values Survey published by the United States National Science Foundation. The annual study surveyed people in 97 countries to discover who is happiest. The survey asked people two simple questions about their happiness and their level of satisfaction with life. Puerto Rico and Colombia completed the top three happiest nations. Zimbabwe was found to be the least happy, with Russia and Iraq also in the bottom 10. The study was directed by University of Michigan professor Ronald Inglehart. He says that unlike other studies, which have focused on economic factors, his research has found that financial prosperity is not the only reason for happiness. The world is becoming a happier place overall, according to the survey, which has been conducted since 1981. Dr Inglehart says that gender equality is also an indicator of happiness, as is rising social tolerance. He says that both of these things have risen dramatically in recent years. The world's wealthiest nation, the United States, was found to be the world's 16th happiest country, behind Switzerland, Canada and Sweden. The study also found that the countries at the bottom of the list all struggle with widespread poverty or authoritarian governments. Zimbabwe, which is gripped by hyperinflation, and has recently seen a controversial presidential election marred by violence, was found to be the least happy nation amongst the countries covered by the survey. 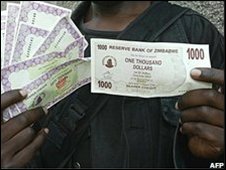 Zimbabwe has suffered hyperinflation and political violence. But Nigeria used to be the happiest. Where are we now? The ranking is done yearly. With some Yaradua touch maybe Nigeria will come back on top. As our president, he can if he want. Has anybody been to Denmark, my partner is Danish and it is truly a wonderful Country, very family friendly and everyone speaks English. This talk of a nation being the happiest na fabu, jare. e no hold water. The survey can never be correct.How many % of the population did the survey cover? As long as there is life, we must keep doing something, just like conducting contentious surveys such as this, so no problem. All dis na to keep the world going. but the closer the better the result. From all indications, Zim can never be denied that positin...LOL!